"Tuareg" redirects here. For other uses, see Tuareg (disambiguation). The Tuareg people (/ˈtwɑːrɛɡ/; also spelt Twareg or Touareg; endonym: Kel Tamasheq, Kel Tagelmust) are a large Berber ethnic confederation. They principally inhabit the Sahara in a vast area stretching from far southwestern Libya to southern Algeria, Niger, Mali and Burkina Faso. Traditionally nomadic pastoralists, small groups of Tuareg are also found in northern Nigeria. The Tuareg speak the Tuareg languages (also known as Tamasheq), which belong to the Berber branch of the Afroasiatic family. The Tuaregs have been called the "blue people" for the indigo-dye coloured clothes they traditionally wear and which stains their skin. A semi-nomadic Muslim people, they are believed to be descendants of the Berber natives of North Africa. The Tuaregs have been one of the ethnic groups that have been historically influential in the spread of Islam and its legacy in North Africa and the adjacent Sahel region. Tuareg society has traditionally featured clan membership, social status and caste hierarchies within each political confederation. The Tuareg have controlled several trans-Saharan trade routes and have been an important party to the conflicts in the Saharan region during the colonial and post-colonial era. The origin and the meaning of the name Tuareg have long been debated, with various etymologies hypothesized. It would appear that Twārəg is derived from the broken plural of Tārgi, a name whose former meaning was "inhabitant of Targa", the Tuareg name of the Libyan region commonly known as Fezzan. Targa in Berber means "(drainage) channel". Another theory is that Tuareg is derived from Tuwariq, the plural of the Arabic exonym Tariqi. 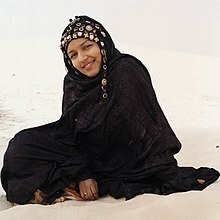 The term for a Tuareg man is Amajagh (variants: Amashegh, Amahagh), the term for a woman Tamajaq (variants: Tamasheq, Tamahaq, Timajaghen). Spellings of the appellation vary by Tuareg dialect. However, they all reflect the same linguistic root, expressing the notion of "freemen". As such, the endonym strictly refers only to the Tuareg nobility, not the artisanal client castes and the slaves. Two other Tuareg self-designations are Kel Tamasheq (Neo-Tifinagh: Kel Tamasheq), meaning "speakers of Tamasheq", and Kel Tagelmust, meaning "veiled people" in allusion to the tagelmust garment that is traditionally worn by Tuareg men. The English exonym "Blue People" is similarly derived from the indigo color of the tagelmust veils and other clothing, which sometimes stains the skin underneath. Another term for the Tuareg is Imuhagh or Imushagh, a cognate to the northern Berber self-name Imazighen. The Tuareg today inhabit a vast area in the Sahara, stretching from far southwestern Libya to southern Algeria, Niger, Mali and Burkina Faso. Their combined population in these territories exceeds 2.5 million, with an estimated population in Niger of around 2 million (11% of inhabitants) and in Mali of another 0.5 million (3% of inhabitants. The Tuareg are also the majority ethnic group in the Kidal Region of northeastern Mali. The Tuareg traditionally speak the Tuareg languages, also known as Tamasheq, Tamachen, Tamashekin, Tomacheck and Kidal. These tongues belong to the Berber branch of the Afroasiatic family. According to Ethnologue, there are an estimated 1.2 million Tuareg speakers. Around half this number consists of speakers of the Eastern dialect (Tamajaq, Tawallammat). The exact number of Tuareg speakers per territory is uncertain. The CIA estimates that the Tuareg population in Mali constitutes approximately 0.9% of the national population (~150,000), whereas about 3.5% of local inhabitants speak Tuareg (Tamacheq) as a primary language. In contrast, Imperato (2008) estimates that the Tuareg represent around 3% of Mali's population. In antiquity, the Tuareg moved southward from the Tafilalt region into the Sahel under the Tuareg founding queen Tin Hinan, who is believed to have lived between the 4th and 5th century. The matriarch's 1,500 year old monumental Tin Hinan tomb is located in the Sahara at Abalessa in the Hoggar Mountains of southern Algeria. Vestiges of an inscription in Tifinagh, the Tuareg's traditional Libyco-Berber writing script, have been found on one of the ancient sepulchre's walls. Kel Ajjer or Azjar: centre is the oasis of Aghat (Ghat). Kel Ahaggar, in Ahaggar mountains. Iwillimmidan Kel Denneg, or Eastern Iwillimmidan: Tchin-Tabaraden, Abalagh, Teliya Azawagh (Niger). Kel Ayr: Assodé, Agadez, In Gal, Timia and Ifrwan. Kel Gres: Zinder and Tanut (Tanout) and south into northern Nigeria. In the late 19th century, the Tuareg resisted the French colonial invasion of their Central Saharan homelands and annihilated a French expedition led by Paul Flatters in 1881. However, in the long run Tuareg broadswords were no match for the more advanced weapons of French troops. After numerous massacres on both sides, the Tuareg were subdued and required to sign treaties in Mali 1905 and Niger 1917. In southern Morocco and Algeria, the French met some of the strongest resistance from the Ahaggar Tuareg. Their Amenokal, traditional chief Moussa ag Amastan, fought numerous battles in defence of the region. Finally, Tuareg territories were taken under French governance, and their confederations were largely dismantled and reorganised. When African countries achieved widespread independence in the 1960s, the traditional Tuareg territory was divided among a number of modern states: Niger, Mali, Algeria, Libya, and Burkina Faso. Competition for resources in the Sahel has since led to conflicts between the Tuareg and neighboring African groups, especially after political disruption following French colonization and independence. There have been tight restrictions placed on nomadization because of high population growth. Desertification is exacerbated by human activity i.e. ; exploitation of resources and the increased firewood needs of growing cities. Some Tuareg are therefore experimenting with farming; some have been forced to abandon herding and seek jobs in towns and cities. In Mali, a Tuareg uprising resurfaced in the Adrar N'Fughas mountains in the 1960s, following Mali's independence. Several Tuareg joined, including some from the Adrar des Iforas in northeastern Mali. The 1960s' rebellion was a fight between a group of Tuareg and the newly independent state of Mali. The Malian Army suppressed the revolt. Resentment among the Tuareg fueled the second uprising. This second (or third) uprising was in May 1990. At this time, in the aftermath of a clash between government soldiers and Tuareg outside a prison in Tchin-Tabaraden, Niger, Tuareg in both Mali and Niger claimed autonomy for their traditional homeland: (Ténéré, capital Agadez, in Niger and the Azawad and Kidal regions of Mali). Deadly clashes between Tuareg fighters (with leaders such as Mano Dayak) and the military of both countries followed, with deaths numbering well into the thousands. Negotiations initiated by France and Algeria led to peace agreements (January 11, 1992 in Mali and 1995 in Niger). Both agreements called for decentralization of national power and guaranteed the integration of Tuareg resistance fighters into the countries' respective national armies. Major fighting between the Tuareg resistance and government security forces ended after the 1995 and 1996 agreements. As of 2004, sporadic fighting continued in Niger between government forces and Tuareg groups struggling for independence. In 2007, a new surge in violence occurred. Since the development of Berberism in North Africa in the 1990s, there has also been a Tuareg ethnic revival. Since 1998, three different flags have been designed to represent the Tuareg. In Niger, the Tuareg people remain diplomatically and economically marginalized, remaining poor and not being represented in Niger's central government. The Tuareg traditionally adhered to the Berber mythology. Archaeological excavations of prehistoric tombs in the Maghreb have yielded skeletal remains that were painted with ochre. Although this ritual practice was known to the Iberomaurusians, the custom seems instead to have been primarily derived from the ensuing Capsian culture. Megalithic tombs, such as the jedar sepulchres, were also erected for religious and funerary purposes. In 1926, one such tomb was discovered south of Casablanca. The monument was engraved with funerary inscriptions in the ancient Libyco-Berber writing script known as Tifinagh, which the Tuareg still use. During the medieval period, the Tuareg adopted Islam after its arrival with the Umayyad Caliphate in the 7th century. In the 16th century, under the tutelage of El Maghili, the Tuareg embraced the Maliki school of the Sunni, which they now primarily follow. Despite being Muslim, they are not Arab. The Tuareg helped spread Islam further into the Western Sudan. While Islam is the religion of the contemporary Tuareg, historical documents suggest that they initially resisted the Islamization efforts in their traditional strongholds. According to the anthropologist Susan Rasmussen, after the Tuareg had adopted the religion, they were reputedly lax in their prayers and observances of other Muslim precepts. They have also retained elements of pre-Islamic cosmology and rituals, particularly Tuareg women. For example, Tuareg religious ceremonies contain allusions to matrilineal spirits, as well as to fertility, menstruation, the earth and ancestresses. Norris (1976) suggests that this apparent syncretism may stem from the influence of Sufi Muslim preachers on the Tuareg. The Tuaregs have been one of the influential ethnic groups who have helped spread Islam and its legacy in North Africa and the adjacent Sahel region. Timbuktu, an important Islamic center famed for its ulama, was established by Maghsharan Tuareg at the start of the 12th century. It flourished under the protection and rule of a Tuareg confederation. In 1449, a Tuareg ruling house also founded the Tenere Sultanate of Aïr (Sultanate of Agadez) in the city of Agadez in the Aïr Mountains. 18th century Tuareg Islamic scholars, such as Jibril ibn 'Umar, later preached the value of revolutionary jihad. Inspired by these teachings, Ibn 'Umar's student Usman dan Fodio would go on to lead the Fulani jihads and establish the Sokoto Caliphate. The Tuareg society has traditionally featured clan membership, social status and caste hierarchies within each political confederation. Clans have been a historic part of the Tuaregs. The 7th century invasion of North Africa from the Middle East triggered an extensive migration of Tuaregs such as the Lemta and the Zarawa, along with other fellow pastoral Berbers. Further invasions of Banu Hilal and Banu Sulaym Arab tribes into Tuareg regions in the 11th century moved the Tuareg southward into seven clans, which the oral tradition of Tuaregs claims to be descendants of the same mother. Each Tuareg clan (tawshet) is made up of family groups constituting a tribe, each led by its chief, the amghar. A series of tawsheten (plural of tawshet) may bond together under an Amenokal, forming a Kel clan confederation. Tuareg self-identification is related only to their specific Kel, which means "those of". For example, Kel Dinnig (those of the east), Kel Ataram (those of the west). The position of amghar is hereditary through a matrilineal principle, it is usual for the son of a sister of the incumbent chieftain to succeed to his position. The amenokal is elected in a ritual which differs between groups, the individual amghar who lead the clans making up the confederation usually have the deciding voice. The matrilineal inheritance and mythology among Tuareg clans, states Susan Rasmussen, a cultural vestige from the pre-Islamic era of the Tuareg society. According to Rasmussen, Tuareg society exhibits a blend of pre-Islamic and Islamic practices. As such, patrilineal Muslim values are believed to have been superimposed upon the Tuareg's traditional matrilineal society. Other, apparently newer customs include the practice of close-cousin endogamous marriages and polygyny in conformity with Islamic tenets. Polygyny, which has been witnessed among Tuareg chiefs and Islamic scholars, is in turn thought to be contrary to the pre-Islamic monogamous tradition of the nomadic Tuareg. Tuareg society has featured caste hierarchies within each clan and political confederation. These hierarchical systems have included nobles, clerics, craftsmen and unfree strata of people. Traditionally, Tuareg society is hierarchical, with nobility and vassals. The linguist Karl-Gottfried Prasse (1995) indicates that the nobles constitute the highest caste. They are known in the Tuareg language as imúšaɣ (Imajaghan, "the proud and free" in Arabic). The nobles originally had a monopoly on carrying arms and owning camels, and were the warriors of the Tuareg regions. They may have achieved their social status by subjugating other Tuareg castes, keeping arms to defend their properties and vassals. They have also collected tribute from their vassals. This warrior nobility has traditionally married within their caste, not to individuals in strata below their own. A collection of tribes, each led by a noble, forms a confederation called amanokal, whose chieftain is elected from among the nobles by the tribal chiefs. The chieftain is the overlord during times of war, and receives tribute and taxes from tribes as a sign of their submission to his authority. The vassal-herdsmen are the second free strata within Tuareg society, occupying a position just below that of the nobles. They are known as ímɣad (Imghad, singular Amghid) in the Tuareg language. Although the vassals were also free, they did not own camels but instead kept donkeys and herds of goats, sheep and oxen. They pastured and tended their own herds as well those owned by the nobles of the confederation. The vassal strata have traditionally paid an annual tiwse, or tribute to the nobles as a part of their status obligations, and also hosted any noble who was traveling through their territory. In the late Medieval era, states Prasse, the previously existing weapon monopoly of the nobility broke down after regional wars took a heavy toll on the noble warrior strata, and thereafter the vassals carried weapons as well and were recruited as warriors. After the start of the French colonial rule, which deprived the nobles of their powers over war and taxation, the Tuaregs belonging to the noble strata disdained tending cattle and tilling the land, seeking instead soldiering or intellectual work. A semi-noble strata of the Tuareg people has been the endogamous religious clerics, the marabouts (Tuareg: Ineslemen, a loan word that means Muslim in Arabic). After the adoption of Islam, they became integral to the Tuareg social structure. According to Norris (1976), this strata of Muslim clerics has been a sacerdotal caste, which propagated Islam in North Africa and the Sahel between the 7th and the 17th centuries. Adherence to the faith was initially centered around this caste, but later spread to the wider Tuareg community. The marabouts have traditionally been the judges (qadi) and religious leaders (imam) of a Tuareg community. According to the anthropologist Jeffrey Heath, Tuareg artisans belong to separate endogamous castes known as the Inhædˤæn (Inadan). These have included the blacksmith, jewelers, wood workers and leather artisan castes. They produced and repaired the saddles, tools, household items and other items for the Tuareg community. In Niger and Mali, where the largest Tuareg populations are found, the artisan castes were attached as clients to a family of nobles or vassals, and carried messages over distances for their patron family. They also are the ones who traditionally sacrifice animals during Islamic festivals. These social strata, like caste systems found in many parts of West Africa, included singers, musicians and story tellers of the Tuareg, who kept their oral traditions. They are called Agguta by Tuareg, have been called upon to sing during ceremonies such as weddings or funerals. The origins of the artisanal castes are unclear. One theory posits a Jewish derivation, a proposal that Prasse calls "a much vexed question". Their association with fire, iron and precious metals and their reputation for being cunning tradesmen has led others to treat them with a mix of admiration and distrust. According to Rasmussen, the Tuareg castes are not only hierarchical, as each caste differs in mutual perception, food and eating behaviors. For example, she relates an explanation by a smith on why there is endogamy among Tuareg castes in Niger. The smith explained, "nobles are like rice, smiths are like millet, slaves are like corn". In the Tuareg areas of Algeria, a distinct tenant-peasant strata lives around oases known as izeggaghan (or hartani in Arabic). Traditionally, these local peasants were subservient to the warrior nobles who owned the oasis and the land. The peasants tilled these fields, whose output they gave to the nobles after keeping a fifth part of the produce. Their Tuareg patrons were usually responsible for supplying agricultural tools, seed and clothing. The peasants' origins are also unclear. One theory postulates that they are descendants of ancient people who lived in the Sahara before they were dominated by invading groups. Some speak a Songhay dialect along with Tuareg and Arabic. In contemporary times, these peasant strata have blended in with freed black slaves and farm arable lands together. Bellah constitute the historic slave strata within Tuareg society. The Tuareg confederations acquired slaves as well as tribute paying states by conducting raids on communities to their south in West Africa. They also secured captives as war booty or purchased slaves in markets. The slaves or servile communities are locally called Ikelan (or Iklan, Eklan), and slavery was inherited, with the descendants of the slaves known as irewelen. According to the ethnographer Johannes Nicolaisen (1963), the Ikelan are of assimilated Nilotic origin rather than of Berber heritage like the ethnic Tuareg. They often live in communities separated from other castes. The Ikelan's Nilotic extraction is denoted via the Ahaggar Berber word Ibenheren (sing. Ébenher), which alludes to slaves that only speak a Nilo-Saharan language. The slaves of the Tuareg were generally of Sub-Saharan African heritage (Nilo-Saharan or Niger-Congo ethno-linguistic origins) and were captured during raids. The word ikelan itself means "to be black", an allusion to most of the slaves. In the post-colonial literature, the alternate terms for Ikelan include "Bellah-iklan" or just "Bellah" derived from a Songhay word. According to the historian Starratt (1981), the Tuareg evolved a system of slavery that was highly differentiated. They established strata among their slaves, which determined rules as to the slave's expected behavior, marriageability, inheritance rights if any, and occupation. The Ikelan later became a bonded caste within Tuareg society, and they now speak the same Tamasheq language as the Tuareg nobles and share many customs. According to Heath, the Bella in the Tuareg society were the slave caste whose occupation was rearing and herding livestock such as sheep and goats. When French colonial governments were established, they stopped acquisition of new slaves and slave trading in markets, but they did not remove or free domestic slaves from the Tuareg owners who had acquired their slaves before the French rule started. In the Tuareg society, like with many other ethnic groups in West Africa, slave status was inherited, and the upper strata used slave children for domestic work, at camps and as a dowry gift of servants to the newlyweds. According to Bernus (1972), Brusberg (1985) and Mortimore (1972), French colonial interests in the Tuareg region were primarily economic, with no intention of ending the slave-owning institution. The historian Klein (1998) states instead that, although French colonial rule indeed did not end domestic slavery within Tuareg society, the French reportedly attempted to impress upon the nobles the equality of the Imrad and Bella and to encourage the slaves to claim their rights. He suggests that there was a large scale attempt by French West African authorities to liberate slaves and other bonded castes in Tuareg areas following the 1914–1916 Firouan revolt. Despite this, French officials following the Second World War reported that there were some 50,000 "Bella" under direct control of Tuareg masters in the Gao–Timbuktu areas of French Soudan alone. This was at least four decades after French declarations of mass freedom had happened in other areas of the colony. In 1946, a series of mass desertions of Tuareg slaves and bonded communities began in Nioro and later in Menaka, quickly spreading along the Niger River valley. In the first decade of the 20th century, French administrators in southern Tuareg areas of the French Sudan estimated that "free" to "servile" groups within Tuareg society existed at ratios of 1 to 8 or 9. At the same time, the servile "rimaibe" population of the Masina Fulbe, roughly equivalent to the Bella, constituted between 70% to 80% of the Fulbe population, while servile Songhay groups around Gao made up some 2/3 to 3/4 of the total Songhay population. Klein concludes that approximately 50% of the population of French Soudan at the beginning of the 20th century was in some servile or slave relationship. While post-independence states have sought to outlaw slavery, results have been mixed. Certain Tuareg communities still uphold the institution. Traditional caste relationships have continued in many places, including slaveholding. In Niger, where the practice of slavery was outlawed in 2003, according to the ABC News, almost 8% of the population are still enslaved. The Washington Post reported that many slaves held by the Tuareg in Mali were liberated during 2013-14 when French troops intervened on behalf of the Malian government against Islamic radicals allied to the Tuareg. The Tuareg social stratification involving noble, clerical and artisanal castes likely emerged after the 10th century, as a corollary of the rising slavery system. Similar caste institutions are found among various other communities in Africa. According to the anthropologist Tal Tamari, linguistic evidence suggests that the Tuareg blacksmith and bard endogamous castes evolved under foreign contact with Sudanic peoples since the Tuareg terms for blacksmith and bard are of non-Berber origin. Correspondingly, the designation for the endogamous blacksmiths among the southern Tuareg is gargassa (a cognate of the Songhay garaasa and Fulani garkasaa6e), whereas it is enaden among the northern Tuareg (meaning "the other"). Archaeological work by Rod McIntosh and Susan Keech McIntosh indicates that long-distance trade and specialized economies existed in the Western Sudan at an early date. During the 9th and 10th centuries, Berbers and Arabs built upon these pre-existing trade routes and quickly developed trans-Saharan and sub-Saharan transport networks. The successive local Muslim kingdoms developed increasing sophistication as states, their martial capacity, slave raiding, holding and trading systems. Among these Islamic states were the Ghana Empire (11th century), the Mali Empire (13th and 14th centuries), and the Songhay Empire (16th century). Slavery created a template for servile relationships, which developed into more complex castes and social stratification. Tuareg culture is largely matrilineal. Tuareg women have high status compared with their Arab counterparts (see matrilineality). Other distinctive aspects of Tuareg culture include clothing, food, language, religion, arts, astronomy, nomadic architecture, traditional weapons, music, films, games, and economic activities. In Tuareg society women do not traditionally wear the veil, whereas men do. The most famous Tuareg symbol is the tagelmust (also called éghéwed and, in Arabic, litham), sometimes referred to as a cheche (pronounced "shesh"), a combined turban and veil, often indigo-blue colored. The men's facial covering originates from the belief that such action wards off evil spirits. It may have related instrumentally from the need for protection from the harsh desert sands as well. It is a firmly established tradition, as is the wearing of amulets containing sacred objects and, recently, verses from the Qur'an. Taking on the veil is associated with the rite of passage to manhood; men begin wearing a veil when they reach maturity. The veil usually conceals their face, excluding their eyes and the top of the nose. 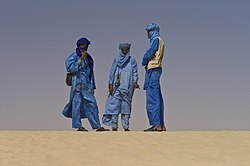 The Tuareg are sometimes called the "Blue People" because the indigo pigment in the cloth of their traditional robes and turbans stained their skin dark blue. The traditional indigo turban is still preferred for celebrations, and generally Tuareg wear clothing and turbans in a variety of colors. Taguella is a flatbread made from wheat flour and cooked on a charcoal fire; the flat disk-shaped bread is buried under the hot sand. The bread is broken into small pieces and eaten with a meat sauce. Millet porridge called a cink or a liwa is a staple much like ugali and fufu. Millet is boiled with water to make a pap and eaten with milk or a heavy sauce. Common dairy foods are goat's and camel's milk called akh, as well as cheese ta komart and Tona a thick yogurt made from them. Eghajira is a beverage drunk with a ladle. It is made by pounding millet, goat cheese, dates, milk and sugar and is served on festivals. A popular tea called "atai" or "ashahi" is made from Gunpowder Green Tea mixed with sugar. After steeping, it is poured three times in and out of the teapot over the tea, mint and sugar and served by pouring from a height of over a foot into small tea glasses with a froth on top. The Tuareg natively speak the Tuareg languages. A dialect cluster, it belongs to the Berber branch of the Afroasiatic family. Tuareg is known as Tamasheq by western Tuareg in Mali, as Tamahaq among Algerian and Libyan Tuareg, and as Tamajeq in the Azawagh and Aïr regions of Niger. French missionary Charles de Foucauld compiled a dictionary of the Tuareg. Much Tuareg art is in the form of jewellery, leather and metal saddle decorations called trik, and finely crafted swords. The Inadan community makes traditional handicrafts. Among their products are tanaghilt or zakkat (the 'Agadez Cross' or 'Croix d'Agadez'); the Tuareg sword (Takoba), many gold and silver-made necklaces called 'Takaza'; and earrings called 'Tizabaten'. Pilgrimage boxes have intricate iron and brass decorations, and are used for carrying items. While living quarters are progressively changing to adapt to a more sedentary lifestyle, Tuareg groups are well known for their nomadic architecture (tents). There are several documented styles, some covered with animal skin, some with mats. The style tends to vary by location or subgroup. The tent is traditionally constructed for the first time during the marriage ceremony and is considered an extension of the union, to the extent that the phrase "making a tent" is a metaphor for becoming married. Because the tent is considered to be under the ownership of a married woman, sedentary dwellings generally belong to men, reflecting a patriarchal shift in power dynamics. Current documentation suggests a negotiation of common practice in which a woman's tent is set up in the courtyard of her husband's house. It has been suggested that the traditional tent construction and arrangement of living space within it represent a microcosm of the greater world as an aide in the organization of lived experiences so much so that movement away from the tent can cause changes in character for both men and women as its stabilizing force becomes faint. An old legend says the Tuareg once lived in grottoes, akazam, and they lived in foliage beds on the top acacia trees, tasagesaget. Other kinds of traditional housing include: ahaket (Tuareg goatskin red tent), tafala (a shade made of millet sticks), akarban also called takabart (temporary hut for winter), ategham (summer hut), taghazamt (adobe house for long stay), and ahaket (a dome-shaped house made of mats for the dry season and square shaped roof with holes to prevent hot air). Armed Tuareg men depicted in a French book of 1821. Both men carry spears and the tellak dagger attached to the left forearm, the man on the right (a noble) is also armed with the takouba sword. tellak: short dagger kept in a sheath attached to the left forearm. In 2007, Stanford's Cantor Arts Center opened an exhibition, "Art of Being Tuareg: Sahara Nomads in a Modern World", the first such exhibit in the United States. It was curated by Tom Seligman, director of the center. He had first spent time with the Tuareg in 1971 when he traveled through the Sahara after serving in the Peace Corps. The exhibition included crafted and adorned functional objects such as camel saddles, tents, bags, swords, amulets, cushions, dresses, earrings, spoons and drums. The exhibition also was shown at the University of California, Los Angeles Fowler Museum in Los Angeles and the Smithsonian's National Museum of African Art in Washington, D.C. Throughout history, the Tuareg were renowned and respected warriors. Their decline as a military might came with the introduction of firearms, weapons which the Tuareg did not possess. The Tuareg warrior equipment consisted of a takoba (sword), allagh (lance) and aghar (shield) made of antelope's skin. Traditional Tuareg music has two major components: the monochord violin anzad played often during night parties and a small tambour covered with goatskin called tende, performed during camel and horse races, and other festivities. Traditional songs called Asak and Tisiway (poems) are sung by women and men during feasts and social occasions. Another popular Tuareg musical genre is takamba, characteristic for its Afro percussions. tasikisikit: songs performed by women, accompanied by tende (drum); the men, on camel-back, circle the women as they sing. asak: songs accompanied by anzad monocord violin. tagest: dance made while seated, moving the head, the hands and the shoulders. ewegh: strong dance performed by men, in couples and groups. In the 1980s rebel fighters founded Tinariwen, a Tuareg band that fuses electric guitars and indigenous musical styles. Tinariwen is one of the best known and authentic Tuareg bands. Especially in areas that were cut off during the Tuareg rebellion (e.g., Adrar des Iforas), they were practically the only music available, which made them locally famous and their songs/lyrics (e.g. Abaraybone, ...) are well known by the locals. They released their first CD in 2000, and toured in Europe and the United States in 2004. Tuareg guitar groups that followed in their path include Group Inerane and Group Bombino. The Niger-based band Etran Finatawa combines Tuareg and Wodaabe members, playing a combination of traditional instruments and electric guitars. Many music groups emerged after the 1980s cultural revival. Among the Tartit, Imaran and known artists are: Abdallah Oumbadougou from Ayr, Baly Othmany of Djanet. Sebiba[nb 1] Tuareg festival in Djanet, Algeria. The celebrants brandish takouba swords. The first Tuareg feature film, Akounak Tedalat Taha Tazoughai, is being released in 2014 and stars the musician Mdou Moctar. Tiddas, played with small stones and sticks. Kelmutan: consists of singing and touching each person's leg, where the ends, that person is out: the last person loses the game. Temse: comic game try to make the other team laugh and you win. Izagag, played with small stones or dried fruits. Iswa, played by picking up stones while throwing another stone. Melghas, children hide themselves and another tries to find and touch them before they reach the well and drink. Takket, singing and playing all night. Sellenduq one person to be a jackal and try to touch the others who escape running (tag). Takadant, children try to imagine what the others are thinking. Tabakoni: clown with a goatskin mask to amuse children. Abarad Iqquran: small dressed wooden puppet that tells stories and makes people laugh. Maja Gel Gel: one person tries to touch all people standing, to avoid this sit down. Bellus: everyone runs not to be touched by the one who plays (tag). Tamammalt: pass a burning stick, when its blown off in ones hands tells who's the lover. Ideblan: game with girls, prepare food and go search for water and milk and fruits. Seqqetu: play with girls to learn how to build tents, look after babies made of clay. Mifa Mifa: beauty contest, girls and boys best dressed. Taghmart: children pass from house to house singing to get presents: dates, sugar, etc. Tawaya: play with the round fruit calotropis or a piece of cloth. Shishagheren, writing the name of one's lover to see if this person brings good luck. Taqqanen, telling devinettes and enigmas. Maru Maru, young people mime how the tribe works. Tuareg are distinguished in their native language as the Imouhar, meaning the free people; the overlap of meaning has increased local cultural nationalism. Many Tuareg today are either settled agriculturalists or nomadic cattle breeders, though there are also blacksmiths and caravan leaders. The Tuareg are a pastoral people, having an economy based on livestock breeding, trading, and agriculture. Since Prehistoric times Tuareg peoples: the Garamantes have been organising caravans for trading across the Sahara desert. The caravan in Niger from around Agadez to Fachi and Bilma is called in Tamashek: Tarakaft or Taghlamt and the one in Mali from Timbuktu to Taoudenni Azalay. caravans transporting food: dates, millet, dried meat, dried Tuareg cheese, butter etc. caravans transporting salt: salt caravans used for exchange against other products. caravans transporting nothing but made to sell and buy camels. Salt mines or salines in the desert. Taoudenni in far northern Mali. A contemporary variant is occurring in northern Niger, in a traditionally Tuareg territory that comprises most of the uranium-rich land of the country. The central government in Niamey has shown itself unwilling to cede control of the highly profitable mining to indigenous clans. The Tuareg are determined not to relinquish the prospect of substantial economic benefit. The French government has independently tried to defend a French firm, Areva, established in Niger for fifty years and now mining the massive Imouraren deposit. Additional complaints against Areva are that it is: "...plundering...the natural resources and [draining] the fossil deposits. It is undoubtedly an ecological catastrophe". These mines yield uranium ores, which are then processed to produce yellowcake, crucial to the nuclear power industry (as well as aspirational nuclear powers). In 2007, some Tuareg people in Niger allied themselves with the Niger Movement for Justice (MNJ), a rebel group operating in the north of the country. During 2004–2007, U.S. Special Forces teams trained Tuareg units of the Nigerien Army in the Sahel region as part of the Trans-Sahara Counter-Terrorism Partnership. Some of these trainees are reported to have fought in the 2007 rebellion within the MNJ. The goal of these Tuareg appears to be economic and political control of ancestral lands, rather than operating from religious and political ideologies. Despite the Sahara's erratic and unpredictable rainfall patterns, the Tuareg have managed to survive in the hostile desert environment for centuries. Over recent years however, depletion of water by the uranium exploitation process combined with the effects of climate change are threatening their ability to subsist. Uranium mining has diminished and degraded Tuareg grazing lands. Not only does the mining industry produce radioactive waste that can contaminate crucial sources of ground water resulting in cancer, stillbirths, and genetic defects but it also uses up huge quantities of water in a region where water is already scarce. This is exacerbated by the increased rate of desertification thought to be the result of global warming. Lack of water forces the Tuareg to compete with southern farming communities for scarce resources and this has led to tensions and clashes between these communities. The precise levels of environmental and social impact of the mining industry have proved difficult to monitor due to governmental obstruction. The Tuareg are the antagonists of the French Foreign Legion in P. C. Wren's 1924 adventure novel Beau Geste and the films that were based on it. The Tuareg are allies of the European-American protagonists in the 1930 boys' novel Desert Wings by Covington Clarke (pen name of Homer Clarke Venable). Spanish author Alberto Vázquez-Figueroa's novel Tuareg (1980) was his most critically and commercially successful, and was adapted into a 1984 film starring Mark Harmon, Tuareg – The Desert Warrior. The 2005 film Sahara featured a fictionalised group of Tuareg as a faction in a civil war underway in Mali. David W. Ball's 1999 novel Empires of Sand tells the story of French and Tuareg cousins, depicting life among the Hoggar Tuareg. French author J. M. G. Le Clézio's novel Desert tells of the last days of the Tuareg. In 2003 Volkswagen introduced a new SUV named the Touareg. E1b1b is the most common paternal haplogroup among the Tuareg. Most belong to its E1b1b1b (E-M81) subclade, which is colloquially referred to as the Berber marker due to its prevalence among Mozabite, Middle Atlas, Kabyle and other Berber groups. It reaches frequencies of up to 100 percent in some parts of the Maghreb, and is dominated by its sub-clade E-M183. The clade is thought to have originated in North Africa around 14200 years ago. Its parent haplogroup E1b1b is associated with Afro-Asiatic-speaking populations, and is believed to have arisen in the Horn of Africa. Besides E1b1b, Pereira et al. (2011) and Ottoni et al. (2011) observed that certain Tuareg inhabiting Niger and Libya carry the E1b1a1-M2 haplogroup (see table above). This clade is today primarily found among Niger-Congo-speaking populations, which suggests that some Tuareg tribes in parts of Libya and Niger may have assimilated many persons of West African origin into their communities. To wit, around 50% of individuals among the Al Awaynat Tuareg in Libya are E1b1a carriers compared to only 11% of the adjacent Tahala Tuareg. 89% of the Tahala belong instead to the E1b1b Tuareg founding lineage. According to mtDNA analysis by Ottoni et al. (2010), the Tuareg inhabiting the Fezzan region in Libya predominantly carry the H1 haplogroup (61%). This is the highest global frequency found so far of the maternal clade. The haplogroup peaks among Berber populations, and is thought to have arrived from the Iberian Peninsula during the Holocene. The remaining Libyan Tuareg mainly belong to two other West Eurasian mtDNA lineages, M1 and V. M1 is today most common among other Afro-Asiatic speakers inhabiting East Africa, and is believed to have arrived on the continent along with the U6 haplogroup around 40,000 years ago. Pereira et al. (2010) observed greater matrilineal heterogeneity among the Tuareg inhabiting more southerly areas in the Sahel. The Tuareg in the Gossi environs in Mali largely bear the H1 haplogroup (52%), with the M1 lineage (19%) and various Sub-Saharan L2 subclades (19%) next most common. Similarly, most of the Tuareg inhabiting Gorom-Gorom in Burkina Faso carry the H1 haplogroup (24%), followed by various L2 subclades (24%), the V lineage (21%), and haplogroup M1 (18%). The Tuareg in the vicinity of Tanout in Maradi Region and westward to villages of Loube and Djibale in Tahoua Region in Niger are different from the other Tuareg populations in that a majority carry Sub-Saharan mtDNA lineages. In fact, the name for these mixed blood Tuareg-Haussa people is "Djibalawaa" named after the village of Djibale in Bouza Department, Tahoua Region of Niger. This points to significant assimilation of local West African females into this community. The most common maternal haplogroups found among the Tanout Tuareg are various L2 subclades (39%), followed by L3 (26%), various L1 sublineages (13%), V (10%), H1 (3%), M1 (3%), U3a (3%), and L0a1a (3%). 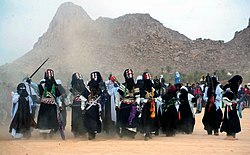 ^ The 3000 year old Sebiba festival is celebrated each year in Djanet (Algeria) where inhabitants of Tassili n'Ajjer and Tuaregs from neighbouring countries meet to simulate through songs and dance the fights that once separated them. ^ a b c d e f Shoup III, John A. (2011). Ethnic Groups of Africa and the Middle East. ABC-CLIO. p. 295. ISBN 978-1598843637. Retrieved 7 November 2016. ^ "The total Tuareg population is well above one million individuals." Keith Brown, Sarah Ogilvie, Concise encyclopedia of languages of the world, Elsevier, 2008, ISBN 9780080877747, p. 152. ^ a b c Lewis, M. Paul (ed. ), 2009. Ethnologue: Languages of the World, Sixteenth edition. Dallas, Tex. : SIL International. Online version: http://www.ethnologue.com/. ^ a b c d e f g h Elizabeth Heath (2010). Anthony Appiah and Henry Louis Gates (ed.). Encyclopedia of Africa. Oxford University Press. pp. 499–500. ISBN 978-0-19-533770-9. ^ Karl G. Prasse 1995. ^ a b c d e f g Susan J. Rasmussen (1996). "Tuareg". In David Levinson (ed.). Encyclopedia of World Culture, Volume 9: Africa and the Middle East. G.K. Hall. ISBN 978-0-8161-1808-3. ^ a b c d e Harry T. Norris (1976). The Tuaregs: Their Islamic Legacy and Its Diffusion in the Sahel. London: Warminster. pp. 1–4, chapters 3, 4. ISBN 978-0-85668-362-6. OCLC 750606862. ; For an abstract, ASC Leiden Catalogue; For a review of Norris' book: Stewart, C. C. (1977). "The Tuaregs: Their Islamic Legacy and its Diffusion in the Sahel. By H. T. Norris". Africa. 47 (4): 423–424. doi:10.2307/1158348. JSTOR 1158348. ^ Karl G. Prasse 1995, pp. 16, 17–22, 38–44. ^ a b Tamari, Tal (1991). "The Development of Caste Systems in West Africa". The Journal of African History. 32 (2): 221–222, 228–250. doi:10.1017/s0021853700025718. ^ Ghoubeid, Alojaly (2003). Dictionnaire touareg-français (in French). Museum Tusculanum. p. 656. ISBN 978-87-7289-844-5. ^ a b James B. Minahan (2016). Encyclopedia of Stateless Nations: Ethnic and National Groups around the World (2nd ed.). ABC-CLIO. p. 418. ISBN 978-1-61069-954-9. ^ Joseph R. Rudolph Jr. (2015). Encyclopedia of Modern Ethnic Conflicts, 2nd Edition [2 volumes]. ABC-CLIO. p. 381. ISBN 978-1-61069-553-4. ^ Briggs, L. Cabot (February 1957). "A Review of the Physical Anthropology of the Sahara and Its Prehistoric Implications". Man. 56: 20–23. JSTOR 2793877. ^ Nicolaisen, Johannes and Ida Nicolaisen. The Pastoral Tuareg: Ecology, Culture and Society Vol. I & II. New York: Thames and Hudson, 1997, pp. 31. ^ Hagan, Helene E. The Shining Ones: An Etymological Essay on the Amazigh Roots of Egyptian Civilization. Bloomington, IN: Xlibris, 2000. ^ "Charles de Foucauld - Sera béatifié à l'automne 2005". Archived from the original on 23 October 2005. Retrieved 21 October 2013. ^ "Berbers: Armed movements". Fotw.us. Archived from the original on 28 May 2013. Retrieved 21 October 2013. ^ Elischer, Sebastian (12 February 2013). "After Mali Comes Niger". Foreign Affairs. Council on Foreign Relations. Retrieved 18 February 2013. ^ Ouachi, Moustapha. The Berbers and the death. El-Haraka. ^ Ouachi, Moustapha. The Berbers and rocks. El-Haraka. ^ a b Foundation, Bradshaw. "The Tuareg the Nomadic inhabitants of North Africa". Bradshaw Foundation. Retrieved 11 October 2017. ^ Wolfgang Weissleder (1978). The Nomadic Alternative: Modes and Models of Interaction in the African-Asian Deserts and Steppes. Walter de Gruyter. p. 17. ISBN 978-3-11-081023-3. , Quote: "The religion of the Tuareg is Maliki Sunni Islam"
^ Schlichte, Klaus (1 March 1994). "Is ethnicity a cause of war?". Peace Review. 6 (1): 59–65. doi:10.1080/10402659408425775. ISSN 1040-2659. ^ Susan Rasmussen (2013). Neighbors, Strangers, Witches, and Culture-Heroes: Ritual Powers of Smith/Artisans in Tuareg Society and Beyond. University Press of America. p. 22. ISBN 978-0-7618-6149-2. , Quote: "Historically, Tuareg and other Berber (Amazigh) peoples initially resisted Islam in their mountain and desert fortresses"
^ Bruce S. Hall (2011). A History of Race in Muslim West Africa, 1600–1960. Cambridge University Press. p. 124. ISBN 978-1-139-49908-8. , Quote: "We remind ourselves that the Tuareg carries this name for having long resisted and refused Islamization." ^ John O. Hunwick (2003). Timbuktu and the Songhay Empire: Al-Saʿdi's Taʾrīkh Al-Sūdān Down to 1613. BRILL Academic. pp. 29 with footnote 1 and 2. ISBN 978-90-04-12822-4. ^ John Hunwick (2003). "TIMBUKTU: A REFUGE OF SCHOLARLY AND RIGHTEOUS FOLK". Sudanic Africa. Brill Academic. 14: 13–20. JSTOR 25653392. ^ John Glover (2007). Sufism and Jihad in Modern Senegal: The Murid Order. University of Rochester Press. pp. 28–29. ISBN 978-1-58046-268-6. ^ Kevin Shillington (2012). History of Africa. Palgrave Macmillan. pp. 231–232. ISBN 978-1-137-00333-1. ^ Johannes Nicolaisen (1963). Ecology and Culture of the Pastoral Tuareg. New York: Thames and Hudson; Copenhagen: Rhodos. pp. 411–412. OCLC 67475747. ^ a b Karl G. Prasse 1995, pp. 16, 17-22, 38-44. ^ Karl G. Prasse 1995, pp. 20-21. ^ Joseph Rudolph Jr. (2015). Encyclopedia of Modern Ethnic Conflicts, 2nd Edition. ABC-CLIO. pp. 380–381. ISBN 978-1-61069-553-4. , Quote: "The Tuareg are seminomadic people of Berber origin. There are various Tuareg clans and confederation of clans. Historically, Tuareg groups are composed of hierarchical caste systems within clans, including noble warriores, religious leaders, craftsmen, and those who are unfree". ^ a b c d e f Jeffrey Heath (2005). A Grammar of Tamashek, Tuareg of Mali. Walter de Gruyter. pp. 7–8. ISBN 978-3-11-090958-6. ^ a b Karl G. Prasse 1995, pp. 16-17. ^ a b Karl G. Prasse 1995, p. 16. ^ Karl G. Prasse 1995, p. 20. ^ a b Karl G. Prasse 1995, p. 17. ^ a b c d e Karl G. Prasse 1995, pp. 17-18. ^ Stewart, C. C. (1977). "The Tuaregs: Their Islamic Legacy and its Diffusion in the Sahel. By H. T. Norris". Africa. 47 (4): 423–424. doi:10.2307/1158348. JSTOR 1158348. ^ Heath, Jeffrey (2005). A Grammar of Tamashek (Tuareg of Mali). Walter de Gruyter. ISBN 978-3110909586. Retrieved 7 November 2016. ^ a b c d e Karl G. Prasse 1995, p. 18. ^ Ruth M. Stone (2010). The Garland Handbook of African Music. Routledge. pp. 249–250. ISBN 978-1-135-90001-4. , Quote: "In Mali, Niger and southern Algeria, Tuareg griots of the artisanal caste practice a related tradition. Known to the Tuareg as agguta, they typically entertain at weddings (...)"
^ Susan Rasmussen (1996), Matters of Taste: Food, Eating, and Reflections on "The Body Politic" in Tuareg Society, Journal of Anthropological Research, University of Chicago Press, Volume 52, Number 1 (Spring, 1996), page 61, Quote: "'Nobles are like rice, smiths are like millet, and slaves are like corn', said Hado, a smith from the Kel Ewey conferdation of Tuareg near Moun Bagzan in northeastern Niger. He was explaining to me the reasons for endogamy." ^ a b c Karl G. Prasse 1995, pp. 19-20. ^ a b Bruce S. Hall (2011). A History of Race in Muslim West Africa, 1600–1960. Cambridge University Press. pp. 5, 7–8, 220. ISBN 978-1-139-49908-8. ^ a b Karl G. Prasse 1995, pp. 18, 50-54. ^ a b Nicolaisen, Johannes (1963). Ecology and Culture of the Pastoral Tuareg: With Particular Reference to the Tuareg of Ahaggar and Ayr. National Museum of Copenhagen. p. 16. Retrieved 6 November 2016. ^ Hsain Ilahiane (2006). Historical Dictionary of the Berbers (Imazighen). Scarecrow. pp. 61–62. ISBN 978-0-8108-6490-0. , Quote: "IKLAN. This term refers to all former black slaves and domestic serfs of traditional Tuareg society. The term iklan means 'to be black'." ^ Gregory Mann (2014). From Empires to NGOs in the West African Sahel. Cambridge University Press. pp. 110–111 with footnote 73. ISBN 978-1-107-01654-5. ^ Starratt, Priscilla Ellen (1981). "Tuareg slavery and slave trade". Slavery & Abolition. 2 (2): 83–113. doi:10.1080/01440398108574825. ^ Karl G. Prasse 1995, p. 19. ^ Martin A. Klein (1998). Slavery and Colonial Rule in French West Africa. Cambridge University Press. pp. 111–112. ISBN 978-0-521-59678-7. ^ Martin A. Klein (1998). Slavery and Colonial Rule in French West Africa. Cambridge University Press. p. xviii, 138–139. ISBN 978-0-521-59678-7. ^ Karl G. Prasse 1995, pp. 49-54. ^ Karl G. Prasse 1995, pp. 50-51. Michael J. Mortimore. "The Changing Resources of Sedentary Communities in Aïr , Southern Sahara", Geographical Review, Vol. 62, No. 1. (Jan., 1972), pp. 71–91. ^ Martin A. Klein (1998). Slavery and Colonial Rule in French West Africa. Cambridge University Press. pp. 138–139. ISBN 978-0-521-59678-7. ^ Kohl, Ines; Fischer, Anja (31 October 2010). Tuareg Society within a Globalized World. ISBN 9780857719249. Retrieved 4 November 2015. ^ Raghavan, Sudarsan (1 June 2013). "Timbuktu's slaves liberated as Islamists flee". Washington Post. Retrieved 4 November 2015. ^ "Mali slavery problem persists after French invasion". USA TODAY. 14 February 2013. Retrieved 4 November 2015. ^ a b Susan McIntosh (2001). Christopher R. DeCorse (ed.). West Africa During the Atlantic Slave Trade: Archaeological Perspectives. Bloomsbury Academic. pp. 17–18. ISBN 978-0-7185-0247-8. ^ Adda Bruemmer Bozeman (2015). Conflict in Africa: Concepts and Realities. Princeton University Press. pp. 280–282 with footnotes. ISBN 978-1-4008-6742-4. ^ Tamari, Tal (1991). "The Development of Caste Systems in West Africa". The Journal of African History. 32 (2): 221–250. doi:10.1017/s0021853700025718. ^ Susan McIntosh (2001). Christopher R. DeCorse (ed.). West Africa During the Atlantic Slave Trade: Archaeological Perspectives. Bloomsbury Academic. pp. 17–21. ISBN 978-0-7185-0247-8. ^ Spain, Daphne (1992). Gendered Spaces. Univ. of North Carolina Press. ISBN 0-8078-2012-1, p. 57. ^ a b Murphy, Robert F. (Apr1966). Untitled review of a 1963 major ethnographic study of the Tuareg. American Anthropologist, New Series, 68 (1966), No.2, 554–556. ^ Naylor, Phillip C. (2015). Historical Dictionary of Algeria. Rowman & Littlefield. p. 481. ISBN 978-0810879195. Retrieved 4 September 2016. ^ Prussin, Labelle "African Nomadic Architecture" 1995. ^ a b Scelta, Gabe (2011). "Much to Learn About Living: Tuareg Architecture and Reﬂections of Knowledge". ^ Rasmussen, Susan (1996). "The Tent as Cultural Symbol and Field Site: Social and Symbolic Space, "Topos", and Authority in a Tuareg Community". Anthropological Quarterly. 69: 14. doi:10.2307/3317136. JSTOR 3317136. ^ Rasmussen, Susan J. (1998). "Within the Tent and at the Crossroads: Travel and Gender Identity among the Tuareg of Niger". Ethos. 26 (2): 164. doi:10.1525/eth.1998.26.2.153. ^ Abada, Latifa (10 September 2016). "La fête Touareg "Sebiba" célébrée en octobre à Djanet". Al Huffington Post (in French). ^ "Mdou Moctar - Akounak Teggdalit Taha Tazoughai TEASER". Retrieved 27 December 2013. ^ "Mdou Moctar protagoniza un nuevo filme documental: "Rain the Color of Red with a Little Blue In It"". conceptaradio. Retrieved 30 December 2013. ^ "Who are the Tuareg?". Smithsonian Institution. Retrieved 21 October 2013. ^ a b c d e Ottoni, C; Larmuseau, MH; Vanderheyden, N; Martínez-Labarga, C; Primativo, G; Biondi, G; Decorte, R; Rickards, O (May 2011). "Deep into the roots of the Libyan Tuareg: a genetic survey of their paternal heritage". Am J Phys Anthropol. 145 (1): 118–24. doi:10.1002/ajpa.21473. PMID 21312181. ^ a b Pereira; et al. (2010). "Y chromosomes and mtDNA of Tuareg nomads from the African Sahel". European Journal of Human Genetics. 18 (8): 915–923. doi:10.1038/ejhg.2010.21. PMC 2987384. PMID 20234393. ^ "E-M81 YTree". www.yfull.com. Retrieved 13 July 2016. ^ Cruciani, Fulvio; Fratta, Roberta La; Santolamazza, Piero; Sellitto, Daniele; Pascone, Roberto; Moral, Pedro; Watson, Elizabeth; Guida, Valentina; Colomb, Eliane Beraud; Boriana Zaharova; Lavinha, João; Vona, Giuseppe; Aman, Rashid; Calì, Francesco; Akar, Nejat; Richards, Martin; Torroni, Antonio; Novelletto, Andrea; Scozzari, Rosaria (May 2004). "Phylogeographic analysis of haplogroup E3b (E-M215) y chromosomes reveals multiple migratory events within and out of Africa". Am. J. Hum. Genet. 74 (5): 1014–22. doi:10.1086/386294. ISSN 0002-9297. PMC 1181964. PMID 15042509. ^ Arredi B, Poloni ES, Paracchini S, Zerjal T, Fathallah DM, Makrelouf M, Pascali VL, Novelletto A, Tyler-Smith C (2004). "A Predominantly Neolithic Origin for Y-Chromosomal DNA Variation in North Africa". Am J Hum Genet. 75 (2): 338–345. doi:10.1086/423147. PMC 1216069. PMID 15202071. ^ Ottoni (2010). "Mitochondria Haplogroup H1 in North Africa: An Early Holocene Arrival from Iberia". PLoS ONE. 5 (10): e13378. CiteSeerX 10.1.1.350.6514. doi:10.1371/journal.pone.0013378. PMC 2958834. PMID 20975840. ^ a b Luísa Pereira; Viktor Černý; María Cerezo; Nuno M Silva; Martin Hájek; Alžběta Vašíková; Martina Kujanová; Radim Brdička; Antonio Salas (17 March 2010). "Linking the sub-Saharan and West Eurasian gene pools: maternal and paternal heritage of the Tuareg nomads from the African Sahel". European Journal of Human Genetics. 18 (8): 915–923. doi:10.1038/ejhg.2010.21. PMC 2987384. PMID 20234393. Karl G. Prasse (1995). The Tuaregs: The Blue People. Museum Tusculanum Press. ISBN 978-87-7289-313-6. Karl Prasse; Ghoubeid Alojaly; Ghabdouane Mohamed (2003). Dictionnaire touareg-français. Copenhague, Museum Tusculanum. ISBN 978-87-7289-844-5. Hourst, Lieutenant (1898) (translated from the French by Mrs. Arthur Bell) French Enterprise in Africa: The Exploration of the Niger. Chapman Hall, London. Rando et al. (1998) "Mitochondrial DNA analysis of northwest African populations reveals genetic exchanges with European, near-eastern, and sub-Saharan populations". Annals of Human Genetics 62(6): 531-50; Watson et al. (1996) mtDNA sequence diversity in Africa. American Journal of Human Genetics 59(2): 437–44; Salas et al. (2002) "The Making of the African mtDNA Landscape". American Journal of Human Genetics 71: 1082–1111. These are good sources for information on the genetic heritage of the Tuareg and their relatedness to other populations. Edmond Bernus, "Les Touareg", pp. 162–171 in Vallées du Niger, Paris: Éditions de la Réunion des Musées Nationaux, 1993. Andre Bourgeot, Les Sociétés Touarègues, Nomadisme, Identité, Résistances, Paris: Karthala, 1995. Hélène Claudot-Hawad, ed., "Touregs: Exil et Résistance". Révue du Monde Musulman et de la Méiterranée, No. 57, Aix-en-Provence: Edisud, 1991. Claudot-Hawad, Touaregs, Portrait en Fragments, Aix-en-Provence: Edisud, 1993. Hélène Claudot-Hawad and Hawad, "Touaregs: Voix Solitaires sous l'Horizon Confisque", Ethnies-Documents No. 20-21, Hiver, 1996. Sylvie Ramir, Les Pistes de l'Oubli: Touaregs au Niger, Paris: éditions du Felin, 1991. Wikimedia Commons has media related to Tuareg. "Tuareg" . Encyclopædia Britannica. 27 (11th ed.). 1911. Italian Wikipedia: A comprehensive tuareg chronology along with lists of amenokals from Kel Ahaggar, Kel Adagh and Kel Azawagh (Italian).